This unique anatomy set combines the most recently published editions of Gray's Anatomy for Students and Sobotta Atlas of Human Anatomy, delivering a total of four volumes loaded with all the expert knowledge you need for success in your anatomy courses. 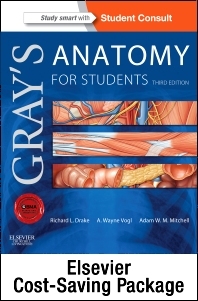 Gray's Anatomy for Students, 3rd Edition focuses on just the core information you need, presenting everything in an easy-to-read, visually appealing format that facilitates study. New "In the Clinic" boxes offer access to in-depth clinical discussions related to specific diseases or procedures, while a list of relevant study aids at the beginning of each chapter allows you to source your review material quickly and easily. A brand-new visual map summarizing cranial nerve distribution and function is ideal for improving your comprehension. You can also access the entire contents online at Student Consult, where you'll be able to take advantage of an online anatomy and embryology self-study course, medical clinical cases, physical therapy clinical cases, self-assessment questions, and more. The Sobotta Atlas of Human Anatomy Package, 15th Edition is the most thorough review for anatomy exam preparation! This three-volume set includes descriptive legends accompanying each figure help to identify the most important features, while numerous clinical examples present anatomical details in a wider context. An additional booklet containing 100 tables on muscles and nerves supports systematic study.